Located across the parking lot of the delicious restaurant, House of Q, is another popular place known as Bob Roe’s for short. It is a conveniently located restaurant that is just a few blocks from campus. The interior walls are covered in sports memorabilia ranging from old to new and it is fairly dark lighting. A lot of the memorabilia was from Morningside, but also included a bunch from the bigger schools like Iowa, ISU, and even Nebraska. We were greeted when we walked through the doors and were directed to a back room with tables set up for our group. I had only been to Bob Roe’s a few times leading up to this visit, but have only ordered the hot wings and the pizza. I was willing to try something new this time if it sparked my interest and if it was hot or spicy at all. I scanned over the menu and noticed a few items, but I wasn’t able to stray from what I loved. 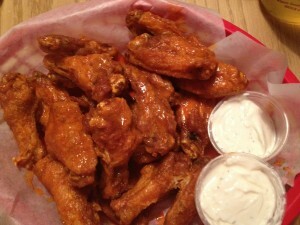 I decided to order the hot wings with their amazing sour cream ranch dip on the side. Their homemade wing sauce tasted fantastic and had a nice kick to it which only led me to dip them in the sour cream ranch. The two worked hand-in-hand to create a tasty meal for me. 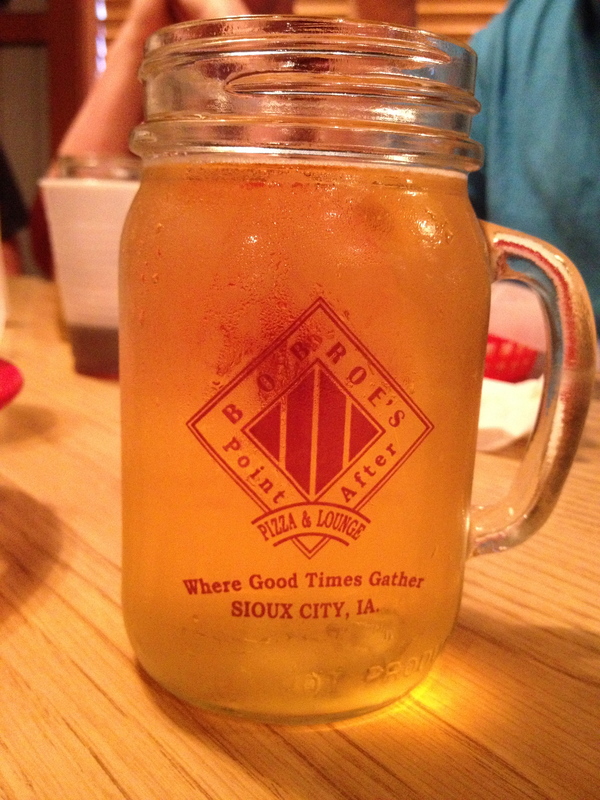 The hotness of the wings started to creep up on me, so the only logical choice for me was to order a frosty beer in one of their signature mason jar mugs. The beer did its job and complimented the wings tremendously. I was then able to get a couple slices of pizza from my friends which completed my meal. With no room left in the stomach for dessert, I threw my remaining 5 wings in a box and headed home. After eating at Bob Roe’s Point After four times now, I would rate the service as excellent. The wait staff has been friendly each time and was on hand when we needed refills or extra things for our food. Many students in our class have met the owners before and that shows that they care about their customers, which is good to see. It is a pretty inexpensive place to eat and would be a great place to bring your family. It is common to find youth sports teams having their banquets because there is a small arcade that provides entertainment for them while their parents are able to watch the many TV’s mounted on the walls all around the place. Bob Roe’s’ big night is wing night which is on Wednesdays and the building is packed each week. I have no complaints on the food as the pizza and wings have tasted great during each visit. I hope to try something new eventually, but it will be pretty hard to stray from the normal selection of wings, beer, and pizza.